How Did Golems Go From Jewish Mysticism to D&D Icons? They come with feet of clay, swinging monstrous arms thicker than a man's waist. They're destruction engines. Rock made flesh - the golem. From D&D scenarios to Minecraft and even in PokÃ©mon, the rock monsters are perhaps the most well-known boss mook in gaming history. But their influence goes beyond that too, almost every rock elemental you fight or summon looks and behaves like the golem. But before golems were a final-wave baddie, they were a creature from Jewish folklore. Animated from clay and sent to do their master's bidding, these golems were, some claim, the first depiction of a robot in human folklore. And like his metallic progeny, while the Golem can be a helpful force he can quickly turn into a rampaging menace, killing everything in his wake. So what's the Golem's story? To hear the classic tale, let's step back to 16th century Prague, a world of magic and repression, when the Jewish people needed supernatural aid. It was the late 1500s, and Prague's Jewish ghetto was in trouble. Holy Roman Emperor Rudolf II had falsely accused them of killing Christian children and using their blood in rituals - a common lie during that time - and sent soldiers into the ghetto to drive the residents out. In desperation, the community's rabbi Judah Loew ben Bezalel went down to the banks of the Vltava River and sculpted a hulking man out of mud. Using kabalistic rituals known only to a few, he inscribed the Hebrew word emet or "truth" on the creature's forehead, bringing it to life. The risen golem patrolled the streets, defending the people from anti-Semitic mobs. He could turn invisible and summon the dead to his aid. But one day the Golem went mad and began a murderous rampage. To protect the people, Rabbi Leow smeared mud on the creature's forehead, changing the word emet to met, or dead. The creature fell lifeless on the spot, its animation gone. Rabbi Leow stored its body in the attic of Prague's Old-New Synagogue, ready to resuscitate the monster should Prague's Jews ever be under threat again. Legend has it, when German soldiers broke into the Synagogue during World War II, the Golem rose again and tore the Nazis apart with its gigantic hands. Or maybe that's just what they tell the tourists. After all, the golem is something a cottage industry in Prague. While this sounds like a classic fairy tale, golems are a part of the belief system in the mystical Kabbalah sect of Judaism. In Kabbalah, it's believed that a spiritually powerful practitioner or Rabbi can call on God's creative power through combining letters in the Hebrew alphabet into potent words, often understood as shem or one of the names of God. According to mystical texts from the Middle Ages and Early Modern Judaism, there are several ways to create a golem. A studied and righteous man could recite word combinations that begin with the first eleven letters of the Hebrew alphabet, giving life to the inanimate - a ritual reflecting the Kabbalah belief that God created the world out of words, numbers and sounds. Alternately, a practitioner could spread dust on the ground and write the letters ADM (man) in them, then chant combinations until the golem emerged from the dust. A particularly dramatic ritual involved dancing around the clay figure in an ecstatic trance. However, the most famous method involved either inscribing a shem on the golem's forehead, or writing the inscription on a piece of paper and placing it in its mouth. Destroying the golem involved either reciting the animating chant backwards, fouling the inscription, or pulling the shem from the creature's mouth. Words made the golem, and words could unmake it as well. But while the golem was animated matter, it wasn't alive as such. Lacking a soul, it was mute, understood commands literally and had nearly no independent thought. Golems were not people or even a creature - they were machinery, something deactivated rather than killed. This distinction was important in early golem stories, which drove home that while mankind can create much like God does, we lack the ability to give our creations the divine spark of life. This is made explicit in the Talmud, where it's specified that when God made Adam out of clay, the first man existed for twelve hours before God game him a soul - in other words, men were once golems as well. Thus, the golem legend was a metaphor for man's imperfect creative ability and the limits of his power. The act of making a golem was a metaphorical reenactment of God creating humanity, but also emphasized that even a righteous, wise and powerful man could not create a soul. Indeed, in most stories even this simulacrum of creation proves dangerous. 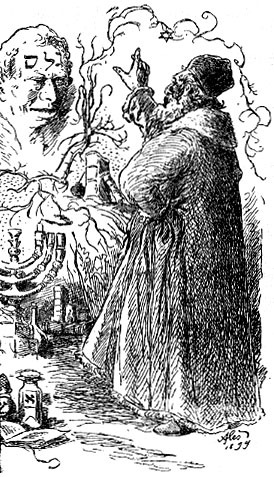 Take the Rabbi Eliyau of Chelm, for instance, who was said to have created a golem in the 16th century. According to an 18th century account, Rabbi Eliyau created a golem as a laborer, but when he saw the creature growing larger each day, he feared that it might destroy the universe. Eliyau destroyed the golem by removing the Holy Name from its forehead, but the struggle left the rabbi with facial scars. In a similar story, a golem created for household chores grows so tall that his master cannot reach the magic amulet to deactivate it. Thinking quickly, he asked the golem to reach down and remove his boots - but when the master hurriedly changed the inscription, the creature toppled over dead and crushed him. 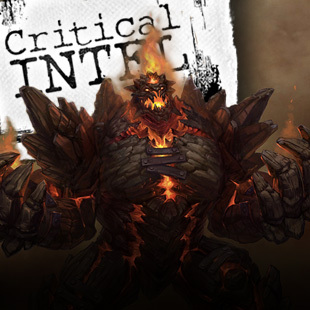 In these stories, creation unleashes forces that the golem-makers cannot control, and they're punished for their hubris. By contrast, the stories where golems are fashioned as protectors and avengers tend to configure them as metaphors for violence. While the Golem of Prague guards the Jewish quarter, for example, in many versions of the story it later attacks the synagogue. From this perspective these are warning tales, suggesting that even justifiable violence conducted in self-defense can corrupt or damage society. The creature, once unleashed, may deal with the threat, but it's ultimately a stupid thing that cannot tell friend from foe, and its maker must deactivate it before it wreaks havoc. This speaks to how force is sometimes necessary but also senseless and unreasoning, and once released it can itself pose a threat to the community. So where do the games come in?